Burial will be at Ft. Custer National Cemetery immediately following the funeral services. Please make checks payable to Portage Public Schools. A kind, softhearted, and compassionate man, William “Bill” Short was a blessing to everyone he met. He worked hard, but he took the time to enjoy life along the way, often with his family by his side. It was easy to see that Bill’s unwavering faith in Jesus was the compass he used to direct his steps. He loved sharing his faith with others especially through acts of service with his gifts in music and his great sense of humor. A devoted family man, he was thrilled to witness his family grow to include the children, grandchildren, and great-grandchildren who were his greatest source of pride and joy. Life will never be the same without Bill here, but he leaves behind a timeless legacy that his loved ones will proudly carry on in his footsteps. The 1930s were a time unlike any other in America as the entire decade was cloaked in the hardship of the Great Depression. Scarce jobs gave way to a soaring unemployment rate, which eventually left countless Americans without their homes. Despite the trials around them, Woodford Dale and Meta Gertrude (Gibson) Short were filled with great joy to announce the birth of the baby boy they named William Eugene on October 14, 1932, in Troy, West Virginia. The oldest of four, he was raised in the family home alongside his siblings, Donald, Ella, and David. The Short family wasn’t immune from the stress and strain of the time. In West Virginia, younger “Billie Gene” (he quickly dropped that nickname) was known to go to school wearing hand me down overalls and no shoes - barefoot.  The Short family may not have had much money but they were wealthy in faith, music and fun. Whatever they did, wherever they went – it included faith, music and fun. During WWII in the early forties, their family moved to Baltimore. His father found work in the steel factory and his mother taught school. Bill attended local schools in Baltimore and graduated from Kenwood High School in 1951. Bill was a fun-loving kid who also enjoyed going to the movies, pulling pranks, playing basketball and baseball. He was an excellent baseball player. He even played ball with the future Hall of Famer, Al Kaline. Bill had an opportunity to play minor league baseball but life, faith, love and war caused him to let that opportunity go. New and exciting changes were in store for Bill when he met the young woman of his dreams. Her name was Ruth Hayes, and they met in the church youth group. Bill was an answer to prayer for Ruth as her deepest desire was to meet a strong Christian man. Ruth was Bill’s first and only girlfriend. Ruth and Bill quickly fell in love and the sweethearts were married on June 21, 1952, at Open Bible Church in Baltimore. Later that fall Bill was drafted into the Air Force and inducted into the military. Because he was a talented musician, he was chosen to be in the Air Force band. Bill’s dental care lacked as a child. Besides getting a military haircut, he also was given the needed dental care and oral surgery needed to keep him ready for duty. The only catch was – he had to play his horn the day after surgery to stay in the band and not be sent to combat. Bill chose to play his horn no matter how much it hurt. Although he did not see any combat, he vividly remembered playing at parades sending soldiers off to combat. Knowing that many soldiers would not come back deeply affected Bill and it stayed with him his entire life. His Air Force issued dentures lasted 60 some years! The Air Force took him to Biloxi, MS and Oakland, CA. It also gave him opportunities to play his music with many now well-known musicians of today. Together Bill and Ruth welcomed four children including Ruth, Dale, Johanna, and Stephanie into their hearts and home. He was a caring and fun father who was actively involved in the lives of his kids. They especially liked it when Bill told little “dad jokes.” A musician himself, he started all the kids on some type of instrument, and he also got the kids involved in sports. Bill taught his children the value of hard work and how to deal with people in all types of situations. To provide for his family, Bill worked hard. He worked 2-3 jobs to provide for his family. His last line of work before he retired was General Manager of hospital linen services in various places. He worked himself up to management by first working the night shift driving a truck to deliver clean and dirty hospital linens. Over the years he worked in Baltimore, MD, Minneapolis, MN, Ft. Lauderdale, FL, Houston, TX, and Erie, PA. Despite his long work hours, Bill always managed to have a music-related job at the church they were attending. He also gave private music lessons. 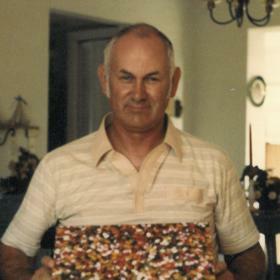 Bill retired in 1998, and they soon moved to Kalamazoo to be closer to family. In everything he did, he had amazing people skills. Bill was able to get the best out of people without having to raise his voice, rather, his gentle nature and encouraging support was most effective. He treated everyone as family and was well respected by all. 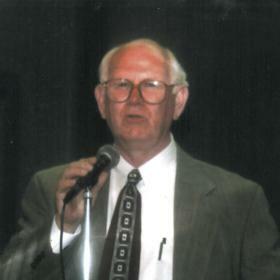 In 1999, Bill’s grandson Eric volunteered Bill to help with the Portage West middle school band. The band director wasn’t actually sure if Bill would show since it was his grandson who volunteered him, but he did show up – and he kept coming! Bill put in countless hours doing whatever was needed in the band room – organizing music, making sure students knew their parts, fixing instruments, crowd control and many private lessons on the side. If a student couldn’t afford a fee, Bill was known to give free lessons as long as the student practiced and progressed. Bill was also instrumental in starting the jazz band in the Portage Middle Schools. Bill had a great rapport with the kids, staff and parents – always had an encouraging word for all – always leaving each one smiling. Bill’s 1,000’s of volunteer hours with the band brought him recognition as he received a coveted Star Award. In addition to his love for music, Bill also enjoyed sports – Senior Softball and playing games such as Scrabble and doing both crossword puzzles and jigsaw puzzles. In 2017, a new senior living complex called Story Point opened up in Portage. He and Ruth were one of the first residents, and with Bill’s gentle and caring spirit and his sense of humor he became well liked in the complex. He organized and led the monthly hymn sing at Story Point. Many attended and were blessed by his music and fun directing. He befriended all the dining room servers who quickly came to know his only dessert choice – ‘a gentleman’s scoop’ (his fancy description of extra scoops) of strawberry ice cream. It was fun to watch them serve to him as he encouraged them in their new jobs at Story Point. A few servers would even bring out his ice cream with fresh cut strawberries on top! His kindness and compassion inspired all in so many ways. 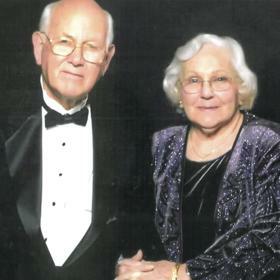 With unending compassion for others, Willam “Bill” Short was a blessing to countless others. He worked hard, but nothing gave him more joy than using his gifts and talents to help as many as he could. 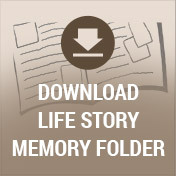 Bill treasured his family, but it was his faith in Jesus that was always first and foremost in his life. Deeply loved, he will be forever missed. 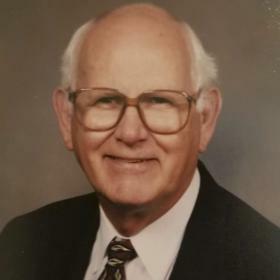 William “Bill” Short, of Portage, went to be with the Lord on Saturday, March 10, 2018. Bill’s family includes his wife, Ruth; 4 children: Ruth Ziegler of Florida, Dale (Sandra) Short of Minnesota, Johanna (Lynn) Hyland of Kalamazoo and Stephanie (Gordon) Velasco of Kalamazoo; 9 grandchildren: Natalie (Richard III) Husted, Nicholas Velasco, Nathaniel Velasco, Lindsey (Travis) Kramer, Jenna (Kyle) Howland, Christopher Short, Eric (Cecilia) Hyland, Kristen Hyland, Cassidy Hyland; 5 great-grandchildren: Lincoln, Emma, Judah, Silas, Connor; 2 siblings, Ella Hayes and David (Sharon) Short; sister-in-law, Candice Short; and many nieces and nephews. Bill was preceded in death by his brother, Donald Short, and a brother-in-law, Christian Hayes. Share food and refreshments and visit with family and friends on Wednesday from 5-8 p.m. at the Betzler Life Story Funeral Home, 6080 Stadium Drive; Kalamazoo (269) 375-2900 where services will be held Thursday at 11:30 a.m. Burial will be at Ft. Custer National Cemetery. 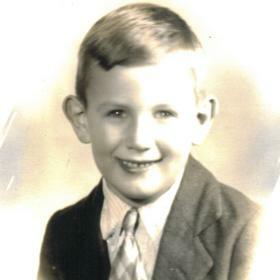 Please visit Bill’s personal web page at www.BetzlerFuneralHome.com, where you can archive a favorite memory or photo and sign his online guestbook before coming to the funeral home. Memorial donations may be made to Portage West Middle School band program.